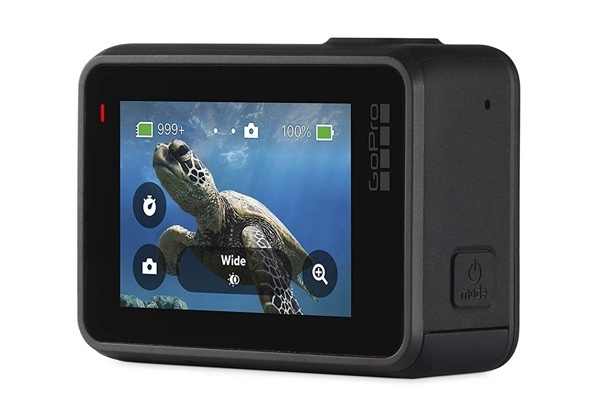 This great offer on the excellent and highly-reputable GoPro HERO7 Black hardware is your opportunity to kickstart an action-packed 2019 without having to pay full price. If adrenaline and excitement are your middle names, then make sure you capture them in glorious 4K quality with this hardware. The GoPro range of action cameras probably shouldn’t really need any formal introductions. The products have been making a name for themselves for years now and continue to stand as the product of choice for anyone who wants to capture their excitement in glorious 4K at the same time as guaranteeing reliability and having access to an array of other accessories to make recording and capturing more fun and diverse. This particular deal is for the GoPro HERO7 Black hardware. It comes with HyperSmooth Video Stabilization, which basically brings gimbal-like stabilization without the gimbal. It does this by predicting movements and automatically corrects for the camera to shake in order to deliver insanely smooth footage. It offers a Super Photo mode to intelligently apply HDR, local tone mapping or noise reduction to optimize captured shots, as well as Time Warp Video Mode to capture super stabilized time-lapse videos while the user moves about a scene. It offers voice control, live streaming functionality, and super high-quality video at 4K 60 frames-per-second. Some people may look at this deal and see that the discount is relatively meager at 11% but when this hardware essentially sells itself then that is definitely a lot and is definitely more than reasonable. Even if you take away all of the advanced functionality and features mentioned above, you’re still left with a highly capable action camera offering a rugged and waterproof design that allows you to share perfectly captured experiences. And, speaking of sharing, the Facebook Live integration means that your social circle can see the wondrous life that you lead as you are leading it at the same time as having these recordings saved directly back to SD card for later viewing. If all of that sounds like something that you need then make sure to grab the deal right now while you can get the 11% discount applied.